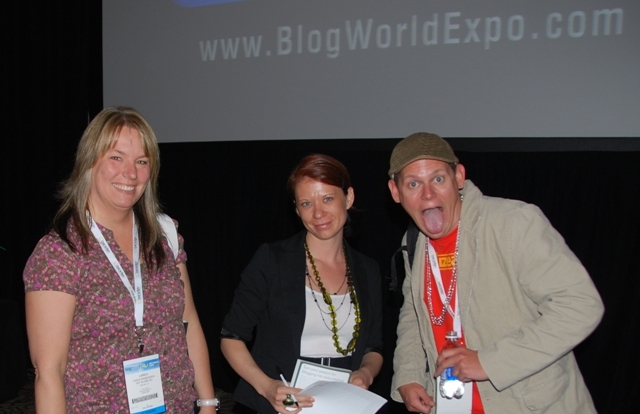 Last year I attended Blogworld for the first time. It was probably the most fun I have ever had at a convention. So this year I was really looking forward to going. After all my blog is now over one year old. Happy birthday Get in and Go! I have loved my year of learning and writing and taking pictures. However, I need to learn more. Life is about learning and growing. 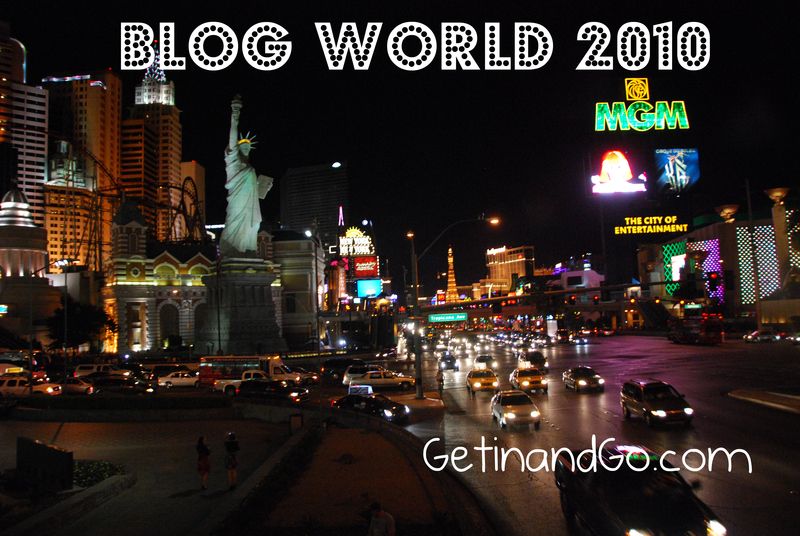 Blogworld is the place to be if you want new ideas and information on writing a blog. Any one who knows me may not know that I am terribly shy, for if you do know me you have gotten past my shy phase and now we are life long friends. I have a fear of meeting new people. What will they think of me? Will I live up to their expectations? Are you thinking right now what expectations would a complete stranger have about her? I don’t know. It’s just a fear. I am getting past that. I am introducing myself to people, talking in front of complete strangers and not really worrying about what anyone thinks. This is something I had to do for me…and my personal paparazzi. My husband loves taking photographs. Kirk uses a [ad name=”Amazon Nikon D60″]and takes it with him everywhere. If we are out in the wilderness, he takes photographs of the beauty that surrounds us. If we are in Las Vegas, he is sure that every other person is a celebrity and therefore, must capture them on film. I stand back and just let him do his thing. Why do I stand back while he takes the pictures? Just in case he gets arrested and I need to bail him out of jail. Like the time we went to Hollywood and just happened upon a movie premier with David and Courtney Arquette. I don’t remember the movie. All I remember is that somehow he was able to position himself toward the front of the red carpet and started taking pictures. He did not get arrested, but he was asked to leave the roped off media section if he didn’t have the media credentials. He tried to convince them that he did have the credentials(and he does for the local television station we run), but you had to get a pass before the premier event. So this year at Blogworld, he got his media credentials and followed me around like I was a famous person and asked me to talk to everyone that we met. Tough for a shy girl. By the end of Blogworld I would tell people, “This is my personal paparazzi and he would like to get a picture of me with you.” I thought it was a great line and you know what…it worked! People were impressed that I had my own paparazzi following me around (at least they seemed impressed) and I had to overcome that shyness just a little. If I keep going to these conventions in time it will vanish completely. Okay, he didn’t really follow me around the whole time. There were a lot of people and events happening that he got photographs of as well. Sometimes I didn’t even know where he was. Like this picture Kirk took with Darren Rowse, I don’t remember it at all. I must have been in a class. Blogworld was held in Las Vegas, Nevada at the beautiful Mandalay Bay Convention Center. There were approximately 4,000 bloggers in attendance. Classes were held on how to be a better blogger, how to monetize your blog, how to add a podcast to your blog, how to network with social media, and many other great topics. There were so many great classes that I could not get to them all. 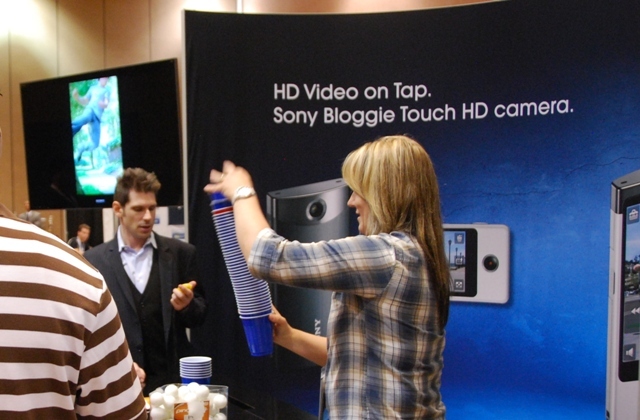 I even got out there and competed in a game to win a [ad name=”Amazon Sony Bloggie Camera”], I didn’t win, but I did beat a couple of men in the competition stacking plastic cups. Girl Power! Check out the blur of my fingers. That is how fast I was moving. Then there was Las Vegas! I live in a town with 800 other people. I am number 801. Not much nightlife in my small town. Really not much going on in the daylight hours either. Las Vegas however, never sleeps. After our all day meetings we walked along the strip to the Bellagio to see the Halloween flowers in the conservatory. 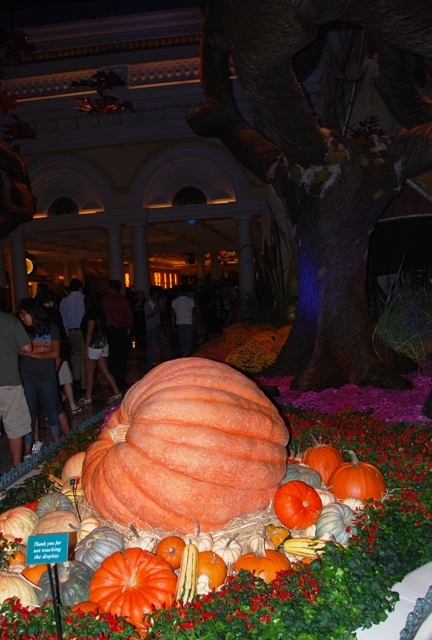 I love the Halloween holiday and the Bellagio had scary trees, a scarecrow and giant pumpkins. Our walk back to our hotel room at the Luxor left my feet throbbing. Early night in Las Vegas? For me, yes! I know there were networking parties all over town but early to bed for another early morning just felt right. The Blogworld Conference was spectacular. I learned so much and now that I am home trying to decipher my handwriting I feel somewhat overwhelmed. Still excited and motivated, but overwhelmed. I am looking forward to implement some of the ideas I learned about and maybe just try some to see how they work for my blog. My personal paparazzi told me I was among some of the greatest bloggers at this convention and I could learn so much if I would just talk to them. 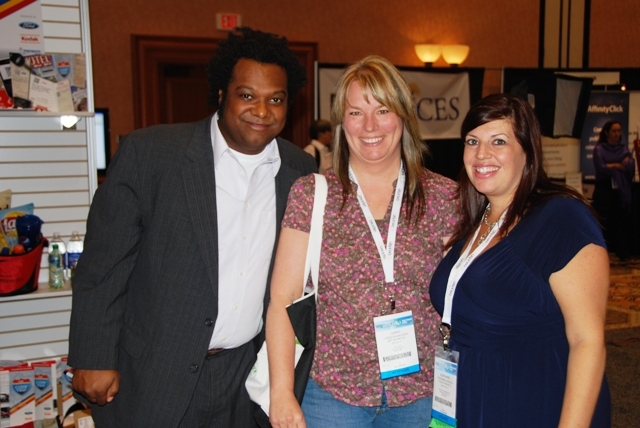 So, take a look at the photographs my personal paparazzi caught of me and my new friends at BlogWorld 2010. B. Bonin Bough, Global Director of Digital & Social Media for Pepsico, and Steph Agresta, Global Director of Digital Strategy & Social Media at Porter Novelli, were signing copies of their book [ad name=”Amazon – Perspectives on Social Media”]. They ran out of copies before I got there, but I had my picture taken anyway. Then we were just walking through the convention center and I recognized Shawn Collins and Murray Newlands from Affiliate Summit. I stopped just to get a little advice on my blog. They were very friendly and helpful giving me a few little tips to get things rolling better with Get in and Go. I saw Lisa Picarille on the showroom floor and I said to her, “You look familiar.” That always gets a conversation going. She was familiar to me. 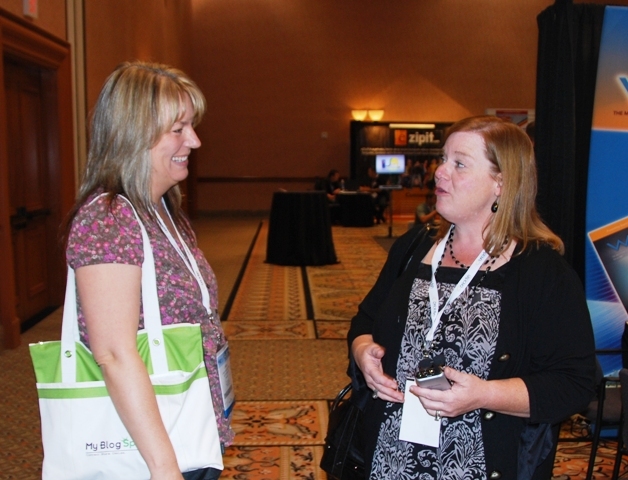 Lisa was a mentor at the Affiliate Summit Conference I went to last January. She remembered me because I told her about my ten kids. Funny that she would remember that. Tina and I attended a class given by Ted Murphy. We had to interact and come up with new ideas the old fashioned way, with paper and pen. Always good to get back to basics when coming up with ideas. 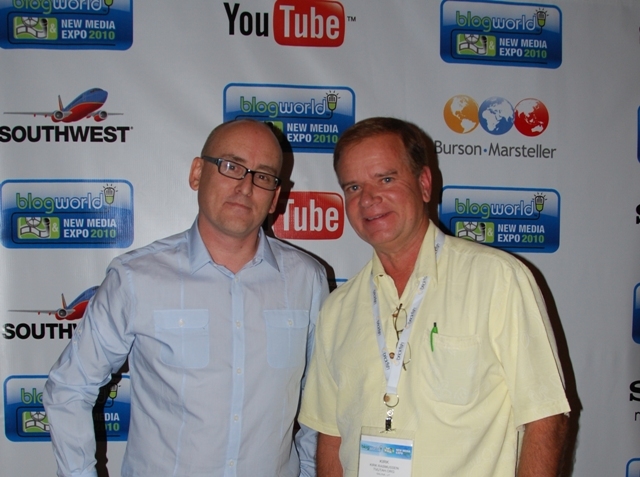 This is just a few of the pictures that we took at Blogworld. If you would like to check out the rest of them, I uploaded a whole bunch here. Lori, It was nice to meet you too. I am still recuperating from Bloggy Boot Camp. I enjoyed reading your blog. Love it!! And huge kudos to you for being willing to get uncomfortable in order to overcome your shyness. You have much to offer others as well so it’s lovely to see you getting out there and making that effort. Wow, Las Vegas is a wonderful city.